Yes, I just said smocktacular. Wouldn't you? Although it really feels like a long time since the estate sale where I picked this up, I realized today that it really has been less than two months. I found it kind of balled up among the fabrics at the sale; clearly a project (I'm guessing it was to have been a long-sleeved dress for a 3- or 4-year-old originally) that had been abandoned long ago. It had bias binding around the neck that was ripped, and a large rectangle cut out of the bottom edge on the back. The sides were not sewn together. When I first grabbed in it the frenzy of the sale, I thought I'd use it for the fabric. 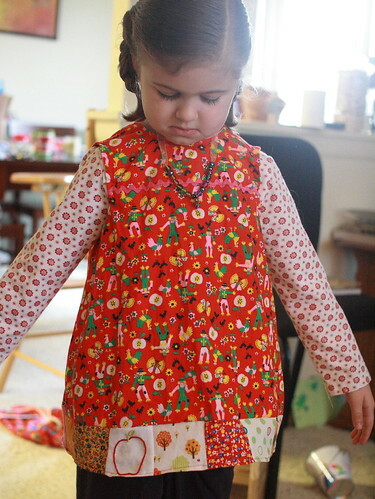 But when I got home and looked at it more carefully, I knew it would be perfect smock for Elisabeth. So I washed it, ironed it, sewed new binding on, made a tie. And then it sat, and sat, in my fabric pile as I mulled over how to repair the rectangle cut out of the back. Then I bought a bunch of tree fabric from Superbuzzy, and it inspired me to try the patches across the bottom. So last night, I finally decided to go for it. I cut 16 3-inch squares and pieced them across the bottom with no rhyme or reason. I embroidered an apple onto one square. And then I just sewed it all together. And Elisabeth? 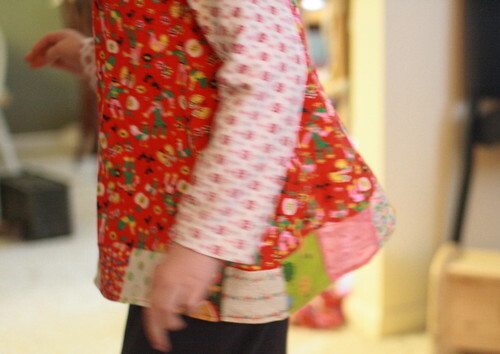 Elisabeth was so very excited to wear her new smock to an art class this morning.